In general, Sativa dominant strains grow taller, producing large, long-running cola’s, often requiring a week or two more in flower to completely mature, compared with Indica dominant varieties. Yields are often increased, with outdoor plants grown over a complete season capable of becoming ‘tree-like’ producing extremely large individual harvests. Sativa dominant marijuana strains are highly popular with both recreational and medical users alike for their long-lasting euphoric effects. With three of the most popular strains combined into one, money-saving packet, you can enjoy a greater variety and cheaper per-seed costs, compared to individual seed pack purchases. All seeds sold with free delivery and guaranteed germination as standard. Chocolope -With a 90% Sativa heritage expect a tall plant, large cola’s and heavy yields. Super Lemon Haze -Large yields of tasty lemon flavored buds with a powerful euphoric high. 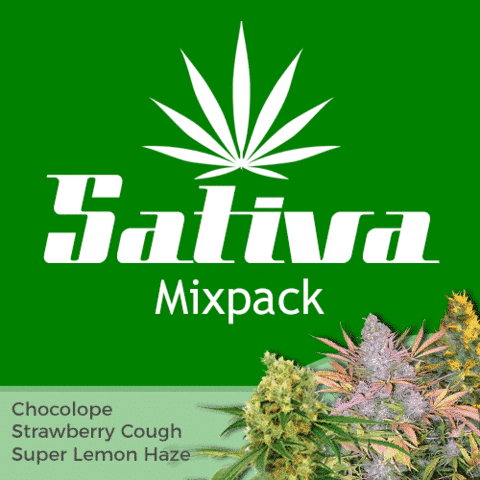 Sativa dominant strains grow taller, producing large, long-running cola’s.